After being suddenly summoned to another world, Subaru Natsuki realized he didn't have superhuman strength, no magic, and no special abilities--except for the ability "Return by Death", which brings him to a set point in the past if he dies. He used his ability to help the bewitching Emilia but was injured and brought to her home to recover. Right when Subaru should be receiving his reward for a job well done, he realizes he's never been more threatened before and this time, he has no idea what the danger is. 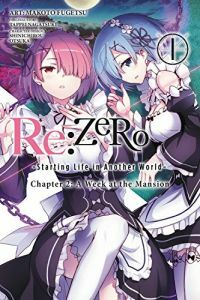 Other products for "RE:Zero" in "Books"
Other products for "RE:Zero" in "Key Chains"
Other products for "RE:Zero" in "Plush"